Cancer is not just one disease, it encompasses many variations of disease. The term cancer is commonly used for diseases where abnormal cells divide in an uncontrolled manner and may invade other tissues and parts of the body through the blood and lymph system. Cancer can take years, or sometimes decades to develop. In the United States, one in four people develops cancer at some point in their lives. A cancer diagnosis can have devastating effects on the patient, their families, and the greater community. With the rates of cancer expected to increase, its burden on society, in terms of lost productivity, and costs of treatment and care, will exacerbate. Extensive research has shown that the risk of cancer depends on a combination of multiple factors: behavioral, genetic and environmental. Anything that increases the chance of developing cancer is called a cancer risk factor. There are also some factors that play a protective role in cancer development. Some of these factors are modifiable or controllable, while others are not. For instance, smoking cigarettes is a modifiable risk factor as a person can control their exposure. The American Institute for Cancer Research has reported that nearly 50% of common cancer cases are preventable . Cancer prevention is any action taken to lower the chance of getting cancer. With the rates of cancer increasing, prevention is more important than ever to curtail cancer incidence. Primary prevention through behavioural interventions – commonly referred to as ‘lifestyle’ interventions – are the most cost-effective long-term strategy to reduce the burden of cancer and lower the number of deaths caused by cancer . Tobacco is the single greatest controllable risk factor for cancer mortality, causing about 30% of all cancer deaths in the United States . Tobacco use is associated with an increased risk of many different kinds of cancers, from bladder and cervical to esophageal and lung. A smoker’s risk of cancer, depending on how long a person has smoked, can be two to ten times higher than a non-smoker’s risk . Exposure to second-hand smoke, also known as environmental tobacco smoke, also increases the risk of cancer and other diseases. The smoke that is exhaled by smokers or created through the burning of tobacco products contains the same cancer-causing chemicals as those inhaled by smokers. Recent evidence has also shown that residual nicotine and other chemicals left on indoor surfaces by tobacco smoke, known as thirdhand smoke, is hazardous and contains cancer causing compounds. Not smoking or quitting smoking dramatically lowers the risk of cancer diagnosis and death. People of all ages can improve their health by quitting smoking. People who quit smoking decrease their risk of lung cancer by over 30% after 10 years, compared to smokers. The risk of mouth or esophagus cancer is cut in half within 5 years after quitting . For cancer survivors, the effects of smoking are even worse: there is an increased risk of cancer recurrence and negative long-term side effects from cancer treatment. Electronic software tools, such as EQUICARE CS™ (ECS), can facilitate this process by providing lung cancer screening forms and guidance to smoking cessation aids. There are two main types of radiation that are associated with an increased risk of cancer: ultraviolet (UV) and ionizing radiation. Ultraviolet (UV) radiation from sunlight is the main cause of nonmelanoma skin cancers. UV-emitting tanning beds have also been classified as carcinogenic. Sunscreen and protective clothing are effective preventive measures. Ionizing radiation is released from medical radiation tests (e.g., x-rays and CT scan) and radon gas present in homes . Radiation used in medicine can be impactful in helping save lives as well as preventing the need for more invasive procedures. However, inappropriate or excessive use may cause harm to patients. Residential exposure arises from radon, a naturally radioactive gas sometimes present in soil, and can increase risk of lung cancers. Vaccines have been developed, and approved by the Food and Drug Administration, for the prevention of two of these cancer-causing agents: hepatitis B virus and human papillomavirus (HPV). These two vaccines can reduces the risk of liver and cervical cancers, respectively. The harmful use of alcohol is a serious health burden, and affects all individuals globally. Risky alcohol intake kills 3 million people every year . Alcohol intake is a risk factor for many cancer types: oral cavity, pharynx, larynx, liver, colorectal, and breast. There is a dose-response relationship between the risk of cancer and alcohol consumption: risk of cancer increases with the amount of alcohol consumed. Physical activity includes any action that requires more energy than resting – working, exercising, and leisure activities. It is essential to maintain a balance between the calories consumed and used. There is substantial evidence that physical inactivity is linked to higher risks of several cancers . The association between colon cancer and physical activity has been extensively studied. It has been found that most physically active individuals have a 24% lower risk of colon cancer, compared to those who were the least physically active . With regards to breast cancer, many studies show that physically active women have a lower risk of breast cancer than inactive women. A meta-analysis has shown that the average breast cancer risk reduction associated with physical activity was 12%. Processed meat is any meat that has been smoked or fermented or includes added salts and nitrites – associated with an increased risk of cancer. Glycemic index (GI), a measure of how fast carbohydrates turn into sugar in the blood, can help identify the whether certain carbohydrates are protective or detrimental for health. Consuming foods with a high GI (sugary drinks and processed foods) is associated with an increased risk of prostate cancer . Conversely, eating lower-GI foods, such as legumes, with associated with a 30% lower risk of both prostate and colorectal cancers. Antioxidants play an important role for cancer prevention since assist in neutralizing free radicals that can damage cells. Calcium may be a protective or a risk factor for certain cancers. Some of these strategies mentioned are an effective alternative for preventing a larger burden of chronic disease worldwide, including cancer. Exposure to these factors is preventable. 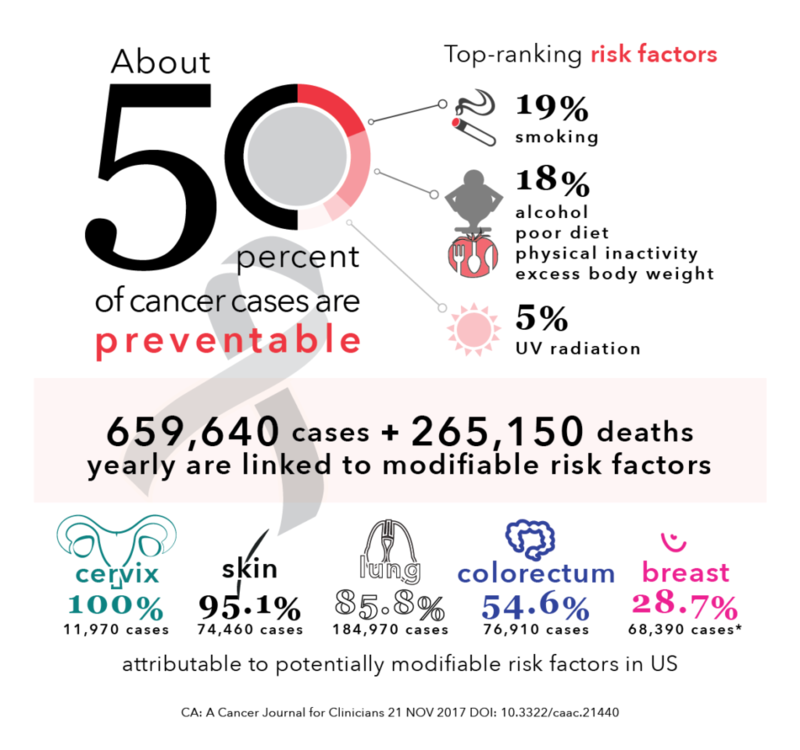 Through reducing exposure to these modifiable risk factors, 694,000 cases of cancer could be prevented in the United States every year . It is important to note that there are things that can be done today to help prevent, delay, or even stop the cancer process. 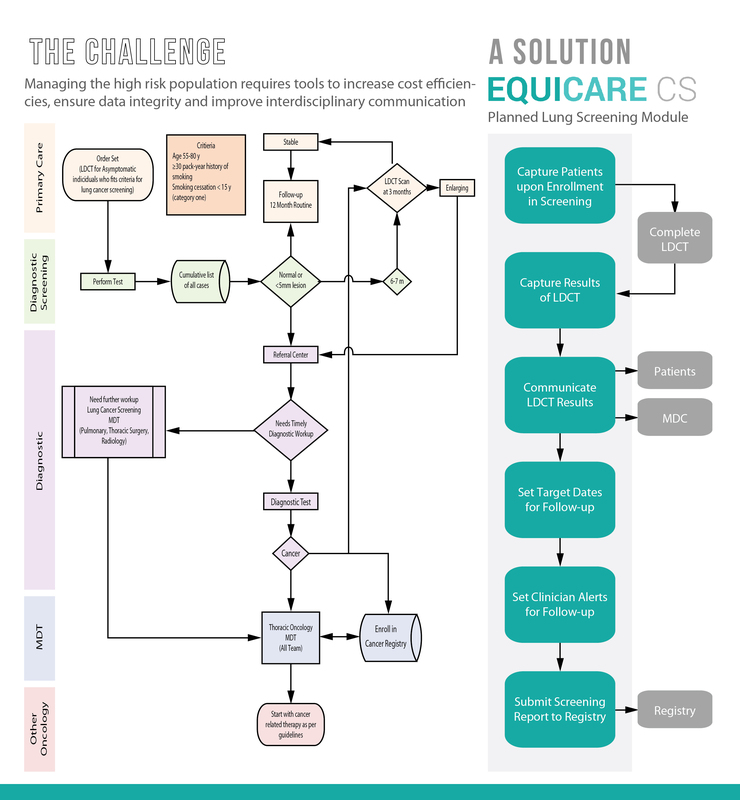 Vancouver, CANADA – April 9, 2019 – Equicare Health, the leading provider of oncology care coordination and patient navigation solutions, officially released the latest version of their product, Equicare CS (ECS) 4.10. Consumerism is one of the greatest driving forces behind innovation. We live in a world where markets focus on the needs and wants of consumers, and the health system does not deviate from this trend. To meet the demands of rising health-related costs and complexity, for patients and health administrations, operational changes have started taking place. Technological advances are the key to instigating operational shifts in the healthcare marketplace. In this piece, we will explore a few overarching barriers within healthcare, and how emerging innovations aim to circumvent barriers for individual patients and the entire health system. Digital health tools can be used to facilitate communication, enhance engagement and bolster relationships. They are about reinforcing and improving the relationship within healthcare, particularly between patient and healthcare providers. Three-quarters of physicians have linked improved patient engagement with digital patient engagement tools, and the majority of physicians had a form of digital education tool in their clinics . Engagement cannot be measured by the initial interaction to a digital tool. If engagement is to be effective, it has to be sustainable. To ensure sustainability, digital tools aim to also impact methods that are of concern for the health system: automation, workflow integration, and provision of actionable data. In essence, consumers, both patients and health administrators, value experience, and have come to expect personalized, targeted approaches to address problems. Patients have been and continue to receive care across multiple health sectors, from primary to acute care. Electronic health records (EHR) tools have been put in place to facilitate the collection of data in healthcare settings. Unfortunately, healthcare providers and organizations continue to utilize fragmented technologies, creating barriers towards collaboration and data sharing opportunities. These barriers are worsened if a patient utilizes both public and private healthcare resources. The information gathered at each interaction with the health system needs to be managed and stored in a manner that can be utilized in the future. To date, artificial intelligence (AI) and machine learning have made incredible impacts on the practice of digital healthcare. In 2019, further advances in the move toward seamless care are expected. As more data feeds into health systems, further advances need to take place to ensure efficient care and the ability to implement solutions are achieved. Standardized software implemented in healthcare settings must provide the technological foundations for data sharing — extending the functionality of EHRs and other technologies that support connected care. Interoperability is a major component in digital health innovation: as health data is received from multiple sectors, secure data exchange becomes imperative in providing continuity of care. With interoperability, data can be aggregated across multiple providers and settings. Applications that target hospitals and medical clinics will include patient monitoring and transcribing notes for EHRs. Lastly, complete access to EHRs for patients and providers is an essential step in the push toward providing a holistic picture of a patient’s health profile to themselves and any care provider resulting in enabled targeted health outcome. Chronic diseases, like heart disease, cancer, stroke, or diabetes, are the leading cause of death and disability in America. 60% of Americans have at least one chronic disease, accounting to over 80% of hospital admissions . These patients and their care need to be managed. Management of chronic illness is one of the key areas of growth in 2019, along with behavioral health and specialty medicine. These needs range from annual wellness exams to the opioid crisis, where healthcare providers are at the forefront to addressing these demands. Platforms and applications that are interoperable with EHR systems will be especially valuable to providers across all health sectors, given the increase in insight and communication telehealth will provide about a specific patient. With limited resources in the health system, from financial constraints to continued demands of regulatory compliance and accreditation, enhanced clinical efficiency via digital health tools will make it easier for healthcare providers to provide care. Integration of such platforms provides physicians with the ability to monitor vital signs and assess reactions to treatments without being physically present while providing real-time diagnosis and intervention without time-consuming office visits. Through the provision of clinical care at a distance, increasing accessibility and eliminating potential delays in care has and will give patients greater control, thus enhancing satisfaction and overall engagement. Digital health now has successfully expanded to include support for a wide range of conditions across the spectrum of care, from behavioral health to cancer, heart conditions, and other complex care conditions. As health systems increase their focus on value-based care and population health, these tools will provide convenient and lower-cost opportunities to access care. Thank you for making 2018 an exceptional year for Equicare! We have been thrilled to welcome so many new users to the Equicare family this year and we look forward to supporting you and your patients for years to come. We will continue to be open for support throughout the holidays, with the exception of closures on December 25th, 26th and January 1st. Lung cancer is the leading cause of preventable cancer deaths worldwide, with over 1.5 million deaths per year. It claims more lives each year than colon, prostate, ovarian, and breast cancers combined . It is a complex disease and usually considered as a result of smoking effects and multiple genetic variations. To add to this, lung cancer has a poor prognosis, with no major improvements in the 5-year survival rate for the past 30 years . In the United States alone, an average of 425 people die from lung cancer each day . When looking at lung cancer statistics and distributions, monitoring and surveillance is recommended for women as development rates are disproportionate between men and women. Mortality rates are projected to increase significantly in the coming years. Women are one-and-a-half-times more likely than men to develop lung cancer, and those who have never smoked are more likely to develop lung cancer when compared to men who have never smoked . Controlling for age, the global lung cancer mortality rate among women is estimated to increase by over 40% from 2015 to 2030 . Having explored the current burden of disease, let us better understand risk factors and the complexity of lung cancer, along with promising interventions to aid and curtail this disease. There are a number of factors that may increase the chance of getting lung cancer, some are controlled and others are uncontrollable . There is a dose-response relationship between the risk of lung cancer and smoking: the risk of lung cancer increases with the length of time and number of cigarettes smoked. Quitting, even after smoking many years, can significantly reduce the chances of developing lung cancer. Second-hand smoke exposure. Smoking causes lung cancer by damaging the cells of the lung. When cigarette smoke is inhaled, whether it be first or second-hand, the lung tissue changes almost immediately. With each repeated exposure, the damage causes cells to behave abnormally, creating tumor cells. Radon gas exposure. Radon is naturally occurring, and its radioactive gas is created from the decay of uranium in minerals present in rock, soil and water. Radon is the leading environmental cause of cancer, the leading cause of lung cancer in non-smokers and the second leading cause of lung cancer in smokers. The World Health Organization estimates around 14% of all lung cancer deaths globally are due to radon exposure. This represents 225,000 of the 1.5 million people that die annually from this disease . Asbestos and carcinogens exposure. Asbestos and other carcinogens – such as arsenic, chromium and nickel – can increase the risk of developing lung cancer, particularly for smokers. Family history. Individuals with a parent, sibling or child with lung cancer have an increased risk of the disease. Unfortunately, there is no guaranteed way to prevent lung cancer. Only risk factors can be controlled to mitigate their effects. Strategies to reduce risk include stopping smoking, avoiding second-hand smoke, testing living environments for radon, avoiding carcinogens, and living a healthy lifestyle. The complexity with lung cancer is that it typically does not cause signs and symptoms in its earliest stages. Individuals at risk of getting lung cancer should screen for the disease regularly. The US Preventive Services Task Force recommends annual screening for lung cancer in current and former smokers aged 55 to 80 years who have a 30 pack-year smoking history and currently smoke or have quit within the past 15 years . Note that smoking is the number one risk factor, but it is not the only one. 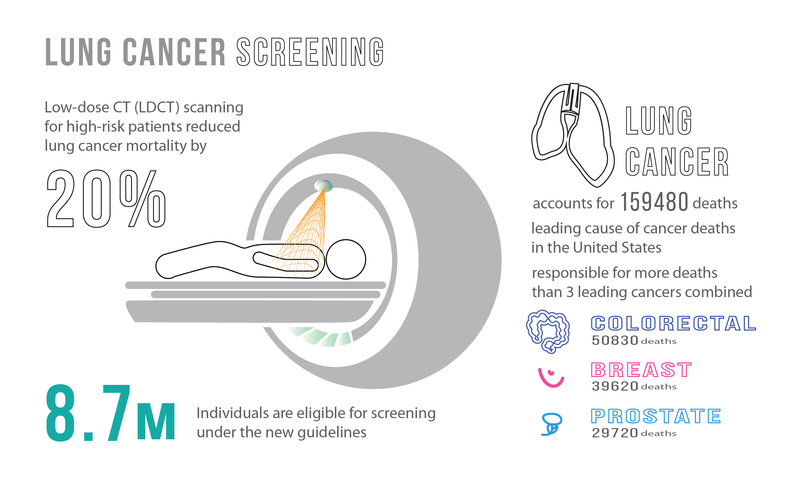 To reduce the burden of disease, a screening test must be able to detect lung cancer at an early stage to allow prognosis modifications, present a low percentage of false-positives, minimize adverse effects (i.e., cancer-induced radiation), and be cost-effective for the health system. ability to locate smaller cancers compared to x-rays. Small cell lung cancer (SCLC). This type is a less common type of lung cancer (about 10% – 15% of all lung cancers)  and occurs almost exclusively in heavy smokers. SCLC is a cancer without a specific treatment and often spreads early. Traditional treatment methods, such as chemotherapy, radiotherapy, and surgery allow about 6% of patients to survive five years post-diagnosis. Recently, researchers have gained insights into gene activity in human SCLC tumors . This finding will allow for the development of personalized medicine approaches to target this form of lung cancer. Non-small cell lung cancer. This type encompasses several lung cancer types that behave in a similar way, these include squamous cell carcinoma, adenocarcinoma, and large cell carcinoma. Currently, the main modalities of lung cancer treatment include surgery, radiation, and chemotherapy. Similar to other cancers, early stage lung cancer is treated with surgery (e.g. video-assisted thoracoscopic surgery and robotic surgery), and more advanced cases are managed with chemotherapy and/or radiation therapy. Typically, a team of specialists from different fields work together to determine the most appropriate treatment options for the patient. The care team may include various types of oncologists, pathologists, nurses, pharmacists, and health administrators. Having a multidisciplinary team is especially beneficial when it comes to coordinating complex treatment protocols involving multiple therapies. There is continuing efforts to improve the survival of patients with lung cancer, focusing on achieving an earlier diagnosis along with developing new targeted or personalized therapies for this disease. The International Association for the Study of Lung cancer has recently highlighted the importance of immunotherapy, a form of personalized medicine and an encouraging treatment method to fight against lung cancer  Lung cancer patients who respond poorly to standard chemotherapy now have more options: most recently two immunotherapy drugs were approved by the U.S. FDA for lung cancer therapy . Even though the survival rate for many lung cancer types still remains low, new targeted therapies and immunotherapies have the ability to change these statistics and are providing new hope. Written by Dorri Mahdaviani , who holds a Masters of Public Health (MPH) from the University of British Columbia (UBC). Her academic and professional interests include the areas of chronic illnesses, health care systems and childhood health and development. Vancouver, CANADA – Nov 1, 2018 – Equicare Health, the leading provider of oncology care coordination and patient navigation solutions, is pleased to announce that it has been recognized as the 59th fastest growing company on the list of the Top 100 Fastest Growing Companies by Business in Vancouver (BIV) for British Columbia. “We would like to thank Business in Vancouver for this award for a fourth year. This recognition is a constant encouragement for our team at Equicare who continues to innovate and find new solutions in delivering cutting-edge solutions in oncology care coordination,” says Len Grenier, CEO at Equicare Health. Equicare Health was previously recognized in the 2013, 2015 and 2017 BIV Top 100 list. Globally, 18.1 million new cases of cancer and 9.6 million cancer-related deaths have been estimated for 2018 . With the number of people worldwide diagnosed with cancer rapidly growing, there is much effort in aiming to curtail cancer progression. All sectors of the cancer community, from research to care, are actively working towards meeting this goal through discovery of novel interventions and their application in cancer care settings. The type and stage of cancer, along with the needs and wants of cancer patients inform the trajectory of care. Some patients may have to go through a combination of treatments, and interact with more than one oncologist, in order to destroy or manage the tumor cancer cells. As mentioned in our last article, there are three main branches of oncology that consist of systemic and non-systemic cancer therapy regimens. Medical oncology treatment measures fall under systemic treatments, where substances travel through the bloodstream in order to reach and affect cells all over the body. Surgical and radiation oncology involve non-systemic therapies, where surgical and radiation oncologists lead the healthcare team through the informing, planning, and administration phases of care. We will continue by exploring the fields of surgical and radiation oncology. 1) Organ preservation surgery – This form of treatment is performed in combination with radiation and/or chemotherapy to shrink tumors. This method allows for a less mutilating but equally effective operation. A usage of this method has been for rectal cancers. In the past, a colostomy was needed for patients with rectal cancers that resulted in a complete removal of the colon and the placement of a permanent bag to drain intestinal content. Now, oncologists are able to shrink tumors with radiation or chemotherapy, leading to a majority of patients having a normal intestinal passageway. same operations as traditional surgery but with smaller incisions. Laparoscopic surgery is routinely offered for cancers of the esophagus, stomach, large intestine and for gynecologic cancers (uterus and cervix). 3) Robotic surgery – This novel technology assists oncology surgeons through a computer interface to perform meticulous surgeries, particularly for abdominal and chest cancers. Through a small incision, the surgeon performs the surgery by sitting at a console that controls the robotic instrument inside the patient. The surgeon has complete control over the robot. The advantage of this robotic technology is that it allows surgeons to reach the narrowest of spaces to clear the tumor, resulting in better visibility and preservation of nerves and critical structures. In addition, less blood is lost by the patient and their recovery time is reduced, when compared to laparoscopy an open surgery. As a newer from of minimally invasive surgery, its costs, limited availability, and need for specialized training are current barriers. Radiation therapy is an important mode of therapy and treatment, where approximately 50% of cancer patients receive radiation therapy in their cancer care continuum and contributes to 40% of all therapeutic treatments for cancer. The main goal of radiation therapy is to kill cancer cells through targeted radiation beams. It aims to reduce the number of healthy cells that are lost during treatment, when compared to systemic therapies, by only targeting the areas of the body affected by cancer. High-energy radiation damages the genetic material of cells, which causes cell death. Unfortunately, the radiation still affects the healthy cells surrounding cancer cells, but the healthy cells have the ability to heal themselves at a faster rate following treatment and retain normal functioning. The birth of radiation therapy took place in 1898, when Marie Curie discovered radium as a source of radiations . Through the years, radiation therapy has evolved. Ongoing advances in techniques and in understanding the biology of cancer cell responses to radiation have led to increased survival and reduced treatment side effects for cancer patients. 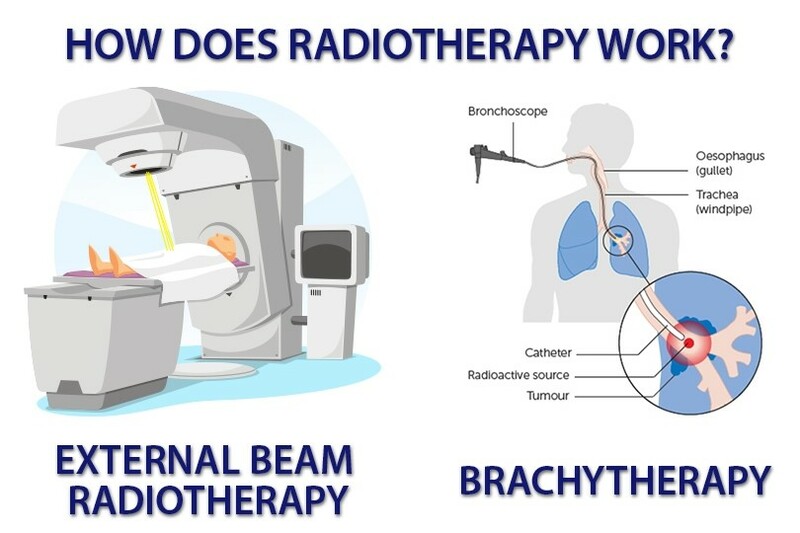 1) External beam radiation is delivered from outside the body by aiming high-energy rays, such as photons, protons or particle radiation, to the tumor site. This method is currently the most common approach in the clinical setting. 2) Internal radiation or brachytherapy  is delivered from inside the body by a radioactive implant, sometimes called a seed or capsule. This form of delivery allows a higher dose of radiation in a smaller area that might be feasible with external radiation treatment. It is technological advances, such as new imaging modalities, more powerful computers, and new delivery systems, that have helped advanced the goal of radiotherapy . 3D conformal radiotherapy (3DCRT) is an imaging technique that allows accurate localization of the tumor and critical normal organ structures. 3DCRT allows for optimal beam placement and shielding. Intensity-modulated radiation therapy (IMRT) is an advanced mode of high-precision radiotherapy that uses computer-controlled linear accelerators to deliver precise radiation doses to a malignant tumor or specific areas within the tumor. IMRT allows radiation oncologists to deliver radiation dosages that conform more precisely to the three-dimensional shape of the tumor by controlling the intensity of the radiation beam. Image-guided radiotherapy (IGRT) uses X-rays and scans to identify the size, shape, and position of the cancer as well as the surrounding tissues and bones. This advancement is beneficial when treatment margins become tighter and more conformal as a positional error would lead to inadvertent radiation of normal healthy organs. IGRT eliminates this unintended consequence as it obtains accurate information through pre-radiotherapy imaging. Stereotactic body radiation therapy (SBRT) delivers very high individual doses of radiation from many different positions around the patient’s body, while meeting at the tumor. In turn, the tumor receives a high dose of radiation and the tissues surrounding it receive a low dose. SBRT has shown excellent results in the treatment of early stage non-small cell lung cancer in patients unfit for surgery. Other tumors include in the prostate, head and neck, hepatic, renal, spinal and pancreatic. Proton beam therapy, also called proton therapy, uses a machine that speeds up protons. These high-speed protons create high energy that gives the targeted radiation dose in the tumor. Proton therapy is becoming more prevalent as it is the most advanced form of radiation available . This method of treatment eliminates exit radiation, so radiation oncologists are able to increase dosage to more powerfully and precisely target tumors. Clinical studies have shown that proton therapy has proven to be a cost-effective treatment for pediatric brain tumor patients . Without a doubt, it is an exciting time for oncology. Rapid progress in this field continues to be boosted by technological advances. While mentioned, and more, treatments methods have already transformed cancer care, the growing understanding of the biology of cancer will take therapy to an entirely new level in the coming decades. The hope is for these tools to address the complexity of cancer – the combination of patient-specific characteristics that drive the development of each person’s disease, response to therapy and long-term toxicities. We look forward to tracking and learning more about these advances, and the dynamic interplay between the three pillars of oncology: medical oncology, surgical oncology, and radiation oncology. Vancouver, CANADA – October 18 2018 – Equicare Health, the leading provider of oncology care coordination and patient navigation solutions, will introduce the latest release of their product, ECS 4.9, at the ASTRO 2018 Annual Meeting in San Antonio. ECS 4.9 is available now. ASTRO attendees and registrants are encouraged to visit Equicare during exhibit hours; October 21 to 23 from 10:00 a.m. to 5:00 p.m. in Booth #2841 to learn more about Equicare’s products and services. Equicare Health is the industry’s leading provider of comprehensive care coordination and patient navigation solutions. Equicare’s flagship solution EQUICARE CS™ (ECS) is a multi-facility web-based software tool, which enables cancer centers to influence clinical outcomes for patients, optimize revenue streams, and increase operational efficiency. ECS facilities patient engagement through patient reported outcomes, patient navigation, and survivorship care. The software provides other clinical tools (including MDT, Clinical trials, education material, and patient engagement) as well as an administrative suite of worklists and reports for managing adherence to accreditation standards (including Meaningful Use, Commission on Cancer (CoC), NAPBC, QUOPI, OCM). ECS enables cancer centers to influence clinical outcomes for patients, optimize revenue streams, and increase operational efficiency. To learn more, please visit www.equicarehealth.com. The cancer care continuum begins at screening and diagnosis and continues onto treatment. Some cancer types— such as skin, breast, and prostate— may be detected by routine self-exams or other screening measures. Cancer may also be diagnosed incidentally when investigating or treating other medical conditions. Further examination is required when abnormalities are noticed by either the patient or a healthcare professional. This investigation involves a thorough physical exam and is enhanced with laboratory studies. When the presence of a tumor is suspected, imaging tests, such as X-rays, computed tomography, magnetic resonance imaging, and endoscopy examinations are ordered. In the final step, to confirm diagnosis, a biopsy is performed in which a tissue sample is removed and studied to identify the presence of cancer cells. These actions help the physicians and the care team determine the cancer’s stage, location, and size. Throughout the duration of the cancer care continuum, patients may go through a combination of treatments to slow tumor growth or eradicate it. It is the cancer and treatment type that will dictate the patient’s main doctor. The relationship built between the cancer care doctor, care team, and patient will most likely last through treatment and into survivorship. In this article, we will focus on the scenario that the care team recommends systemic therapies – such as chemotherapy or immunotherapy – to get rid of cancer cells. We will explore the role of a medical oncologist in providing care along with the latest innovations in medical oncology. Medical oncologists are a core member of the cancer care multidisciplinary team, and offer cancer patients a comprehensive and evidence-based approach to treatment and care. They aim to use safe and cost-effective cancer drugs, while maintaining the quality of life of cancer patients throughout the cancer journey. Contributions of medical oncologists are essential in integrating information, at all levels and settings. For most referrals of suspected or confirmed cancer cases to a medical oncologist, the patient is unsure whether they have a malignant tumor. Understandably, when patients learn that they might have cancer, they want to ensure that they receive the best possible care and treatment. Therefore, good communication and effective patient engagement strategies will facilitate the transmission of realistic information. Chemotherapy is the traditional anti-cancer therapy. Chemotherapy drugs circulate throughout the bloodstream and disperse to destroy cancerous cells in multiple locations. Due to its nature, chemotherapy is often used to treat cancers that have spread beyond their original point of development. Immunotherapy – also called biotherapy – uses biologic agents, concentrated amounts of the body’s natural substances, to boost the immune system to fight cancer cells. The immune system is the body’s defense mechanism. When it detects a threat or abnormal behavior, it reacts. This is called the immune response. At times, the immune system is not strong enough. 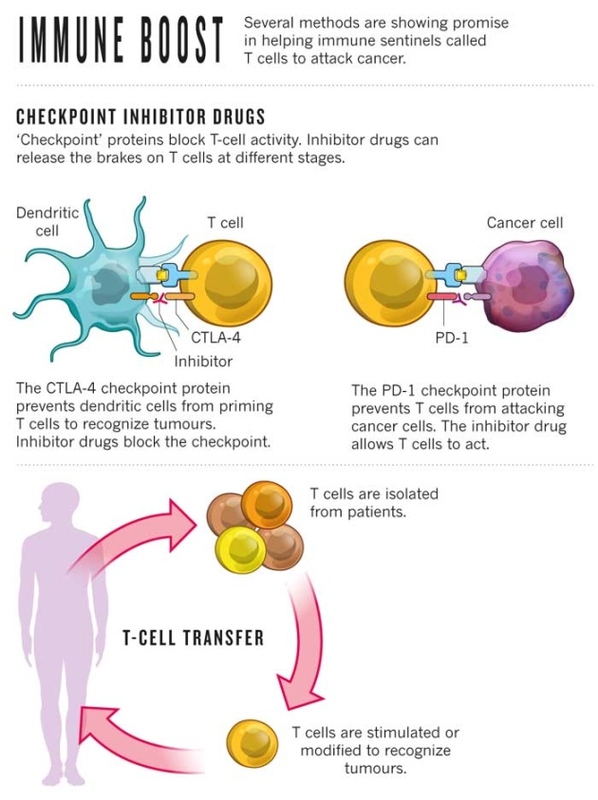 This is where immunotherapy enhances the actions of the immune system to fight cancer cells. Kames Allison, of the United States of America, and Tasuku Honjo, of Japan, won the 2018 Nobel Prize in Medicine for pioneering this ground-breaking cancer treatment approach . They laid the foundation for the development of a number of medicines now approved by the Food and Drug Administration to treat cancers. In 2011, the FDA approved ipilimumab, an anti-CTLA-4 antibody, as a treatment for late-stage melanoma. This drug results in the stimulation of an immune response against melanoma. Even though, there are still a handful of side-effects that need to be monitored by the cancer care team during and post-treatment. Vaccines, medicines that can train the immune system to recognize and destroy unwanted substances, are being utilized to prevent and treat cancers. With regards to cancer treatment vaccines, it may prevent the cancer from recurring, destroy any cancer cells still in the body after other treatments have ended, or stop a tumor from growing or spreading. Researchers are currently testing vaccines for several types of cancers in clinical trials, including breast, cervical, and prostate cancer. 2) Alters the actions of hormones. Hormones are produced by many glands in the body, and act as the body’s chemical messengers. They travel throughout the body to regulate the activity and behavior of cells and organs. In women, estrogen and progesterone, produced by the ovaries, play a role in a woman’s reproduction functions as well as sexual characteristics, which can also trigger the growth of breast cancer. In men, testosterone and dihydrotestostrone, produced by the testicles and adrenal glands, play a role in regulating a man’s sexual development and function. When too many of these hormones are made, prostate cancer may occur. Hormone therapy uses synthetic hormones or drugs to disrupt the action of the body’s natural hormones. It aims to stop the flood of hormones to the affected tissues and prevents the cancer cells from growing. The type of hormone therapy used is unique to the cancer type. For instance, a form of treatment for breast cancer may require Tamoxifen, which is a drug that blocks the receptors on the breast cancer cell. This blockage prevents estrogen from binding to cancer cells. Hormonal therapy in breast cancer has improved disease free survival by 10% in 10 years . Similarly, for prostate cancer, there are several types of hormone therapy measures used to treat prostate cancer, including surgery that removes the testicles. As surgery is a permanent treatment, many patients may resort to medical castration, using drugs to lower the amount of hormones made by the body . Targeted therapies use drugs to interact with cancer cells by targeting specific molecules, such as genes and proteins, involved in cancer growth and spread. These therapies are different from traditional cancer drugs used in chemotherapy, which act on all fast-growing cells. As oncologists are able to match targeted treatments to the patient’s tumor characteristics, these therapies may work more effectively, with fewer side effects. Our previous article explores targeted therapy as a precise method of fighting cancer with drugs. It is clearly evident in our exploration of the field of medical oncology and its main systemic therapies that this field has made incredible advances and will continue to evolve. With strategic collaboration and documentation of information at all levels of care, shortcomings can be alleviated. In our next article, we will explore non-systemic therapies in the fields of surgical and radiation oncology, and discuss how the continuous emergence of health technologies is confronting the growing cancer burden worldwide. The global cancer burden is driving technological advances in cancer research and treatment. Currently, nearly nine million people a year lose their lives to cancer. This equates to approximately 22,000 cancer deaths per day . This burden is expected to grow as the world’s population expands and ages. There is a clear urgency to finding better treatments for current and future cancer patients navigating through the phases of cancer care. The number of new US Food and Drug Administration (FDA) approved therapies and new uses of cancer therapies have been increasing dramatically in recent years. Majority of these improvements are associated with enhancements in patient survival and/or quality of life. Over the next few weeks, we will explore the pertinent cancer care areas of targeted therapy , medical, surgical, and radiation oncology. Advances in cancer care and research allow for precision, and targeted therapy is the foundation of precision medicine. Targeted therapy aims to treat cancer by targeting the changes in cancer cells that help them grow, divide, and spread. This cancer treatment uses drugs and is different from traditional chemotherapy. It works by targeting specific genes and proteins related to cancer growth and spread of tumors. To better understand the “targets” of targeted therapy, it is beneficial to know how cancer cells grow. Cells are the building blocks of every tissue in our bodies. There are many different cell types with different, yet specific functions. Cancer starts when a cell has a mutation – certain genes of healthy cells change. Genes play the most critical role as they tell cells how to function. If genes are altered, so is the functionality of the cell, it might either divide abnormally or live too long. When cells grow out of control, tumors form. 1) Small-molecule drugs: these drugs aim to block the process that helps cancer cells multiply and spread. An example of this type of targeted therapy is angiogenesis inhibitors. These drugs keep the tissue around the tumor from making blood vessels. Hence, anti-angiogenesis therapies starve the tumor by keeping new blood vessels from forming. 2) Monoclonal antibodies: these drugs block a specific target on the outside of cancer cells. They can also send toxic substances directly to cancer cells. It is important to remember that not all cancers type are the same, and not all tumors have the same targets. Therefore, targeted therapies must match the mutation. For instance, if an individual has colorectal cancer, they are tested for the KRAS mutation. This mutation controls the growth and spread of a tumor, and about 40% of colorectal cancers have this gene. When this mutation is present, some targeted therapies are not effective. This identification helps the cancer care team provide the most effective treatment, and protects the patient from unnecessary side effects or treatment costs. With advances such as targeted therapy, healthcare professionals have the ability to match every tumor to the best possible treatment. In the case of breast cancer, approximately 25% of all cases have too much of a protein called human epidermal growth factor receptor 2 (HER2). This protein induces tumor cell growth . 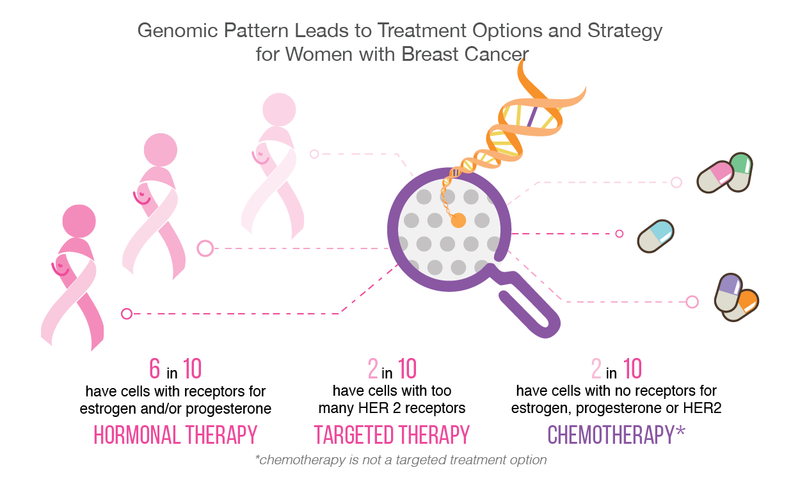 Fortunately, if the type of breast cancer is HER2 positive, then several targeted therapies are available to stop and limit its functionality. HER2-targeted therapies include Trastumab, Pertuzumab, and Neratinib. Some are taken in combination with one another, or along with chemotherapy. Nearly all novel interventions have their own set of limitations and challenges, and targeted cancer therapies are no exception. One limitation is that cancer cells may become resistant to the therapy, meaning that this method will no longer be effective. This may happen if the target changes itself through mutation, or if the tumor finds a new alternative way to induce tumor growth. It is because of this limitation that most targeted therapies may work best in combination with multiple targeted therapies, and/or in combination with one or more chemotherapy drugs. A challenge is that drugs for some identified targets are difficult to develop as the target’s structure and its pathway are regulated within the cell and are not easily accessible. One expected goal for targeted therapies is for them to be less toxic than traditional chemotherapy drugs. However, they too can have side effects that need to be tracked by healthcare professionals. Patients may easily assist in reporting their symptoms through patient-reported toxicity questionnaires. This sharing of knowledge and information will further assist the refinement and enhancement of targeted therapies. Considering these identified obstacles, targeted therapies remain a novel and growing approach to curtailing cancer progression. Cancer care and research are no longer approached through a one-size-fits-all model. Care and treatment have become much more personalized. Doctors and the cancer care team now know that one cancer, whether it be colorectal or breast, can come in many different genetic types. Targeted therapy through the use of drugs and other substances has the ability to more precisely identify and attack cancer cells, providing a promising conduit to diminish or eliminate the cancer care journey altogether.